How did the Haunted Hamburger get its name you ask? Is it really haunted? Here’s the story, you be the judge. It all started years ago when Michelle and Eric Jurisin acquired the restaurant. The building, old and abandoned, was in need of great repair before it could be opened for your dining pleasure. This is when the funny business began. As with all old buildings, when inhabitants take initial occupation, from its walls come the spirits to observe, and sometimes greet the newcomers. The Haunted Hamburger spirits were no different. Not only were these spirits curious but possibly frustrated tradesmen from long ago as it was tools that these spirits liked to take. More specifically, hammers. Yes, hammers. One hammer, then two, then three hammers had disappeared. Was this a case of memory loss? At first it was thought so until a prior owner asked the Jurisins if they had met the ghosts yet and to beware…they liked hammers! Shortly after this confirmation the hammers began to reappear showing up in the most conspicuous places. What followed next was literally too 'in your face' to ignore, says Eric. One day, in the middle of repairs, he remembered he needed to go upstairs to finish a project. Just as he reached the top floor a door that he was standing next to slammed, nearly smashing him in the face. You could argue a cross breeze is strong enough to slam a door, and that would be true. Except, Eric had just sealed up all of the building's windows with thick plastic and tape to keep the cold winter air out. He knew there was no air current in the house. 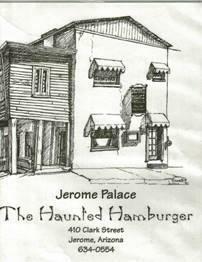 What other odd occurrences frightened staff, owners and guests alike in the Haunted Hamburger? Cans flying off shelves, the hot water being turned on in the middle of the night. Distinct smells in the stair well and even photographs guests have taken capturing the vague image of a woman. Is the Haunted Hamburger truly haunted? Hang out for a while and see for yourself. But leave your hammers at home. Enjoy your Haunted Burger experience in the dining room with a bookshelf in the ceiling, on our airy patio, or the amazing back porch with a view of the Verde Valley and the San Francisco Peaks 50 miles distant. It’s all fun and always terrific food and drink. Want a gift card for someone special?